For new and experienced online and face-to-face instructors, or those who work with them, this session will share concrete strategies for creating community within courses, whether online or face-to-face. Strategies will cover starting the semester, building community throughout, grading class participation, and closing the community at the end of course. 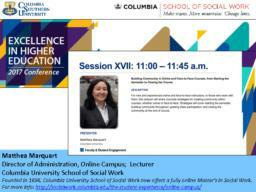 Workshop presented at the Excellence in Higher Education Virtual Conference, Online. (2017, Sept 27). Hosted by Columbia Southern University.